"The sorrel is flash-cooked here, then stirred though right at the end of cooking. This gives the risotto a vibrant green colour and a really fresh taste. I think goat's cheese adds a beautiful creaminess, so I've roasted some here. Crumble it over the risotto when you serve it – it balances the flavours beautifully. Turn down the heat and add a ladleful of warm stock. Keep stirring until the rice has fully absorbed the stock, then add another ladleful. Continue to add the stock, one ladleful at a time, until it's all absorbed. This should take about 15 minutes and give you rice that is beginning to soften but is still al dente. Meanwhile, pop the goat's cheese onto a roasting tray, sprinkle over the fennel seeds and red chilli, and place in the oven for 10 minutes. Next, heat a deep saucepan on a medium heat, then add 1 tablespoon of butter, a splash of olive oil, the garlic and a good grating of nutmeg. Once the butter has melted, add the sorrel and cook for about 2 minutes, moving it around until it's just wilted down. Take the pan off the heat, let the sorrel cool slightly, then chop it finely and season to taste. Take the pan of rice off the heat, add the chopped sorrel and beat in the remaining butter and grated Parmesan. Add a good squeeze of lemon juice, then check the seasoning and add a little salt and pepper if needed. Pop a lid on the pan and leave the risotto to rest for a minute, while you remove the goat's cheese from the oven. 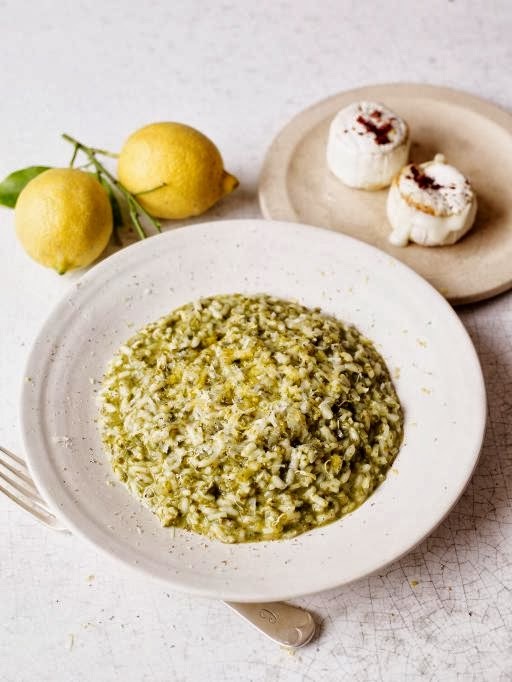 Dish up your risotto, grate a little lemon zest over the top, drizzle with a little extra virgin olive oil, and top with another grating of Parmesan. Serve with the lovely roasted goat's cheese on the side for everyone to crumble over the top".